One of the exciting things that happened this year in the world of film-book publishing is the re-printing of Raymond Durgnat’s book, A Mirror for England: British Movies from Austerity to Affluence. The book is a new contribution in the BFI Silver collection that is re-publishing classic titles, which already includes another Durgnat book A Long Hard Look at ‘Psycho’, as well as Richard Roud’s Godard and Tom Milne’s Mamoulian. Next year they will be re-printing Peter Wollen’s Signs and Meaning in the Cinema. As I’ve argued in my review of Durgnat’s book on Dušan Makavejev’s WR - Mysteries of the Organism (BFI Modern Classics), Durgnat is one of the greatest practitioners of film-criticism and his published writing is a testimony to the lasting worth of the craft. In the book The Language and Style of Film Criticism, which analyses the work of four major English-language critics Durgnat, Manny Farber, Pauline Kael and David Thomson; the editors Andrew Klevan and Alex Clayton highlight Durgnat's description of Godard's Pierrot le fou as a "cine-salad" to then use a similar term to describe Durgnat's signature brand of writing which is that of a "crit-salad." Currently, and besides from the previously mentioned BFI books, there are two of his other books still in print Films and Feelings and The Strange Case Of Alfred Hitchcock: or The Plain Man's Hitchcock (both MIT Press) and he has a few small contributions in anthology collections. It is because of this short supply of Durgnat's writing that any new book of his again in circulation is cause to celebrate. It is also note-worthy that there is a new website (http://www.raymonddurgnat.com/) dedicated to his career and legacy. What makes a book like Films and Feelings (1971) so good is how Durgnat synthesizes his encyclopedic knowledge of film and the other arts within the debates about cinema (Knight, Lindsay, Sarris, Kael, Cahiers, Positif, Movie) building upon what has been said, responding to arguments, and putting forth his own well-thought out and unpretentious position. Durgnat is able to re-iterate the basics of cinema in a unique and compelling new way while also revealing new insights and enlarging the new discourse in interesting ways. For example in the chapter The Cinema's Art Gallery by discussing the medium's potential do to justice towards paintings, Durgnat is slyly suggesting that if directors are to be considered auteurs their films must stand on their own against the works of master painters. The publishing of A Mirror for England is a good start but there remains many of Durgnat's book still unavailable that need to resurface and he deserves a collection of his published writing. There are so many gems out there of his writing that are just waiting to be re-discovered like Durgnat's contributions in old film magazines whether they be Film Comment or The Monthly Film Bulletin. For example here is an excerpt from Amazing Grace: Keeping up with the Jones mystique from American Film ('86), "Watching Grace Jones's video performances reminds me of the great Luchino Visconti's remark that he'd happily make a whole movie with just one actor before one stretch of wall, so rich and varied the human body in performance be." Aside from the great French-film magazine Positif - whose origins are that of French Surrealism, and where Durgnat also once contributed a piece on Powell & Pressburger ('81) - Durgnat's prose needs to be better known to rejuvenate an eclecticism and jouissance in film criticism where it has been lacking. I would like to highlight a few of my favorite comments by Durgnat about his background and method from an interview, ‘Culture Always is a Fog’, that took place with him at the University of California in 1977, which can be found in its entirety over at the website Rouge. Do you recall a specific age when you became interested in movies? Yes, about fourteen, and that was when it started getting systematic. Before that, the Saturday morning tuppenny rush. The first movie I ever saw had two cowboys arguing at a bar and that’s all I remember. The first serial episode I saw had somebody falling off a mast into the sea, and then this pain and agony of ‘to be continued’. When did you start going to movies? Oh, quite early, but films never acquired any great priority of enthusiasm over literature and jazz. It wouldn’t break my heart if all the movies in the world were destroyed tomorrow. I liked French movies very early — the melancholy and half-tones. The pre-war Jacques Préverts and Jean Renoirs, that’s my home key in movies. When did you first start thinking about writing film criticism? It arose naturally out of Eng. Lit., didn’t it? At school, a teacher sent one of my essays to the film critic of The News-Chronicle, the old News Kronk – Richard Winnington, whose selected criticism had just been reissued. He’d been a ‘30s Communist and had become the paper’s social conscience, by some personal moral sincerity. He made Paul Rotha sound like Oscar Wilde, he had this knock-down social consciousness, but pretty sharp. Anti-Hollywood, but with exceptions for The Grapes of Wrath  and Sunday Dinner for a Soldier  and so on. He wrote me a nice little three-line note about this essay; probably that influenced me. I occasionally wrote for student publications but I was too far out for the fifties. I didn’t keep to Winnington’s hard line, of course. But the fifties were very conformist. Worse than the ‘70s, there wasn’t even the memory of challenge. When I praised Bride of Frankenstein  and Invasion of the Body Snatchers , people were very worried and resentful. Oh, ignore it and it’ll go away. And it very often does go away. In fact I did go away, into the film industry. Do you think that criticism is a form of self-expression? Yes, very easily, very treacherously. One treats the artist as a ventriloquist treats his dummy. So much ‘appreciation’ is really an attempt to defuse an artist, to reclaim him. In fact, that’s the challenge. A novelist’s characters can’t resist him as well as an artist can resist his critics. Which is one reason why criticism isn’t an inferior activity. It’s a novel with much tougher characters. Are there particular critics that you do make it a point to read or follow? There are various people whom I read with interest because, whether I agree with them or not, there’s a genuine person speaking from a calibre of experience, not an automatic scanning mechanism. I’m thinking of Pauline Kael, who I rarely agree with; of Robin Wood, who I sometimes agree with; of Manny Farber. And Parker Tyler. At the other extreme, I’m very interested in certain theorists, particularly Jean Mitry and Edgar Morin. What was the motivation behind your early articles? Why did I do it? I think there were some things that had to be said. There was a kind of rendezvous of film and social studies, or social sense, that hadn’t happened. It looked like it was never going to happen. And The Crazy Mirror  and A Mirror for England are about that, and the appendix in Films and Feelings  is about that. The Crazy Mirror and A Mirror for England were written very quickly. They’re full of inaccuracies, which I think doesn’t matter, because the main point was arranging a kind of rendezvous between thinking about movies and thinking not so much about sociology as about the experience that people are having all the time. Those two books really cut across what is probably a more basic interest in the aesthetic language of movies, and how it compares to the other arts. And instead of developing that part of Films and Feelings, I interrupted myself by doing two or three sociology books. I think that confused a lot of issues. On your list of ten favourite directors and ten favourite movies that appeared in Cinema, no. 4, Hitchcock isn’t included. Moreover, in your book about him you claim he is artistically inferior to Michelangelo Antonioni. Why did you choose to write a book about a director who is not among your favourites? The fact that he was becoming so many people’s favourite director was an interesting cultural phenomenon. In some ways a disturbing one. I did admire Hitchcock, but for different reasons. And he’s very symptomatic, as well as extraordinarily clear and lucid in his technique. He’s a supreme bourgeois manipulator. And genuinely expressive. And a virtuoso. One of the things going on in the Hitchcock book is really a continuous kind of tunnelling in which I’m saying, yes, he does make statements; yes, he is an auteur; yes, he does have a coherent philosophy; yes, it’s full of subtleties; there is no finer aesthetic director than Hitchcock in so many ways ... And yet the apparent ruthlessness of Hitchcock skirts very prudently and fearfully around real crunches. Roughly speaking, what kinds of films would you rate most highly? Well, today’s ten best would be as unrepresentative of the long haul as yesterday’s. But currently the directors whose films I’ve most eagerly looked forward to, whether likely to be completely successful or masterpieces or partly boring or not, have been Pasolini, Altman, Jancsó, Borowczyk, Rosi, Alain Tanner, Roeg, Losey. You also have to remember that, not being a critical journalist, there are many movies I don’t see or don’t see until late. If I were writing a regular column and were in synch, things might be different. Perhaps those names are enough to indicate a certain wavelength. Why did the English pick up Cahiers instead of Positif? Because English left-wing thinking is ravaged by bourgeois, puritan elitism. And by the alienation which is the Mr Hyde of dissent. And by an inverted chauvinism which becomes Parisotropic. What about the popularity of the Nouvelle Vague? Well, read Premier Plan on the Nouvelle Vague. And Positif. They saw it as the expression of a new free-wheeling bourgeois culture, which had learned to be very mobile, which had learned to be radical in the sense that it was constantly ready to revise its own opinions and its own character, which was just anarcho-bourgeois. After all, Truffaut, Chabrol, Rivette, Rohmer are all thoroughly conservative directors now. First Look: Yonah Lewis and Calvin Thomas' "The Oxbow Cure"
The film-making Toronto duo Yonah Lewis and Calvin Thomas follow up their first feature Amy George, a coming-of-age story about an unhappy adolescent, with The Oxbow Cure. The new film is about a woman (Claudia Dey, the mother from Amy George) who retreats from society to a cottage to recuperate from an illness. The website describes the film as, "When rivers meander and are sometimes cut off from their course, they form an oxbow lake." This much-anticipated film is still waiting to be premiered at a film festival. The website for The Oxbow Cure is now online. The film magazine Cinema Scope continues its exploration of cutting-edge world cinema, and though many of the films they write about might be unknown to regular film-goers, within the confines of the film distribution system, where only a select few high profile films open up each week on the cineplex’s screens, and where more challenging films are pushed to the margins, writing about these obscure films and filmmakers is a way to maintain the mystery and aura of cinema, fulfilling Jean-Luc Godard's definition of good cinema: "that which you cannot see." In this respect the magazine continues the legacy started by Jonathan Rosenbaum in his book Movie Wars, in which he denounces the corporatization of the film-making industry during the Regan years. In place of this, he favors an engagement with the festival-based cinema of directors like Abbas Kiarostami and his fellow members of the Iranian New Wave. Rosenbaum now even regularly contributes to the magazine with his Global Discoveries on DVD column, where he provides the magazine with a film-history section and overviews of new non-region 1 DVDs. 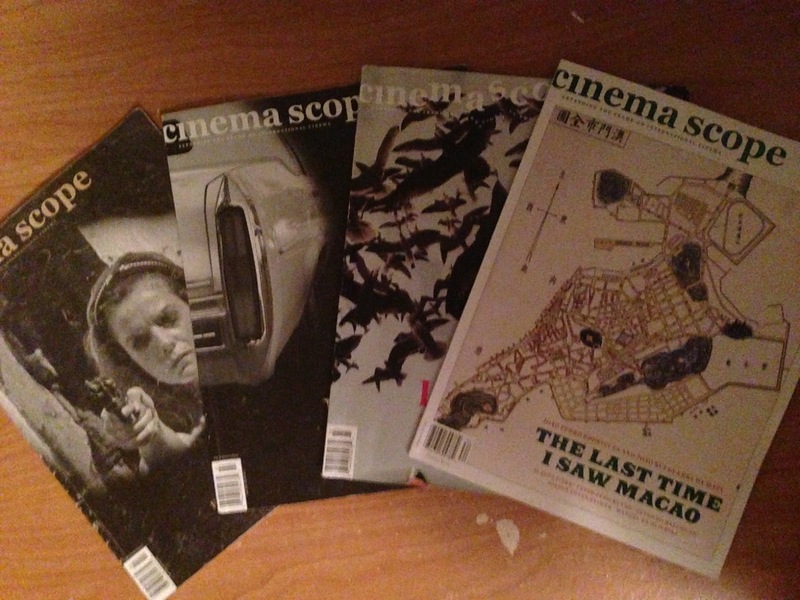 Overall, it has been a good year for Cinema Scope. They started the year with a still from the Miguel Gomes film Tabu on the cover the Spring 2012 issue (N.50). Cinema Scope celebrated this landmark 50th issue with a feature on The Best Fifty Filmmakers Under Fifty ("This list also represents a contemporary Cinema Scope canon."). The issue also includes an interview between Mark Peranson and Jim Hoberman titled Film Criticism After Film Criticism, coverage from the Berlin Film Festival with a focus on Tabu, and Denis Côté writes about his new film Bestiaire. A white limousine is featured on the cover of the Summer 2012 issue (N.51), which could represent either of this year's two great limo films: Leos Carax’s Holy Motors or David Cronenberg’s Cosmopolis. The issue includes Peranson’s characteristic Cannes review, a great review of Wes Anderson’s Moonrise Kingdom, and a contribution by John Gianvito, Deaths of Cinema: Amos Vogel. The cover of the Fall 2012 issue (N.52) features Vérena Paravel and Lucien Castain-Taylor’s Leviathan, which is reviewed by Phil Coldiron and gets a stunning five-page photo spread. The highlight of this issue is a printed conversation between Nicolás Pereda and Kazik Radwanski, Unexpected Textures, moderated by Christopher Heron. Around this time the magazine’s online component stepped up its presence and covered a large chunk of the films that played at TIFF, including all of the new films by the Toronto DIY filmmakers (Tower, Krivina, Lunarcy!, Many a Swan). The new Winter 2013 issue (N.53) features the João Pedro Rodrigues and João Rui Guerra da Mata film The Last Time I Saq Macao on its cover and highlights Portuguese cinema in its editorial, viva o cinema português! The regular roster of local Toronto writers is included: Adam Nayman writes about The Act of Killing and Stories We Tell, Andrew Tracy about Chris Dumas’ book on Brian De Palma, Jason Anderson about Berberian Sound Studio, Andréa Picard about Gabriel Abrantes, John Semley interviews Slavoj Žižek, and there are two new writers to the magazine Calum Marsh who writes about To the Wonder and Blake Wiliams about Spring Breakers. If you're interested in reading the whole review you should check out the newest issue, which should now be available on newsstands or specialty book stores. Or better yet, get a subscription! The French film magazine Cahiers du Cinéma recently dedicated a special issue to what they described as a new generation of New York do it yourself filmmakers (N.670), which included Ronald Bronstein (Frownland), the Safdie brothers, Ramin Bahrani, the guys from Borderline Films, Marie Losier (The Ballad of Genesis and Lady Jaye), Konstantin Bojanov (Avé), Alex Ross Perry (The Color Wheel), and Zbigniew Bzymek. The magazines editor Stéphane Delorme and Nicholas Elliot highlight that even though these films “don’t resemble one another” that they are all “made in New York and have a home-made quality to them, as they are made in their filmmaker's homes, on the streets, with the filmmaker's own money or that of friends or with the help of the Internet.” The filmmakers all have different interest and come from different backgrounds and nationalities, which reflects the city’s diversity. One thing that I find to be interesting about this group of young and up-and-coming filmmakers is that they provide a conceptual model for urban entrepreneurial filmmaking to happen elsewhere, and there seems to be a new generation of filmmakers emerging here in Toronto that seems to be following in this path. Who are these new up-and-coming filmmakers in Toronto? There is Kazik Radwanski (Tower), Antoine Bourges (East Hastings Pharmacy), Calvin Thomas and Yonah Lewis (Amy George), Igor Drljaca (Krivina), Simon Ennis (Lunarcy! ), and Blake Williams (Many a Swan). They are all young filmmakers whose films reflect something exciting going on in the city and, for the majority of them, have only completed a few short-films and perhaps one full-length feature. The two particular films that are under this Bronstein-Safdie influence are Tower and Amy George. Just like the protagonist from the New York films, these two films have a protagonist that wander around their respective neighborhoods trying to reach out to others to have meaningful connections but instead those desires always seem to be thwarted. What makes Tower and Amy George different than the American films is their Canadian spirit and more precisely a local sensibility. In Tower, Derek is pursuing his animation career, living in his parent’s basement, working construction, and starting a relationship. While in Amy George, the teenager Jesse is trying to have a normal life, get along with his parents, connect with a girl that he likes, and finish a photography project. The Black Balloon begins with a stressful man trying to manage a class of students through the busy streets of New York, while holding a bouquet of balloons. This is a similar character to that of Lenny from Daddy Longlegs as in trying to take care of these kids there are many other things that are distracting him, making the task more difficult. The bouquet of balloons that he’s holding from theor white strings are impressive: there are red ones, pink ones, white ones, green ones, blue ones, yellow ones, and purple ones. Together they make a pretty sight. All of the kids, who are being looked after by this single parent supervisor, stare up towards the balloons in amazement. But as the man is helping the kids cross the street, he inevitably accidentally lets go of all of the balloons, and they go flying off into the sky. One balloon flies higher than the rest of them and this is going to be the one that the story will focus on: the black balloon, of the film's title. The Black Balloon is similar to Donald Barthelme'a short-story The Balloon (which, on a side-note, was also a big inspiration for David Foster Wallace), of a balloon that unexplainably starts floating over New York City, but which also represents an extension of one of its character unease over a partner that he’s missing. If for Barthelme the balloon is an imaginative object to represent this lost thing then what does the black balloon represent for the Safdies? The blackness of the balloon is the same color of a blank, black cinema screen. The balloon is going to join people in moments of crisis and create empathy for their plight. This is like cinema itself. The black balloon represents something that watches people in time of need as well as something that comforts, encourages and helps. It is this use of the balloon as a metaphor for the potential of cinema that makes The Black Balloon so beautiful and complex. The black balloon gets stuck in a tree and then gets picked up and thrown into a garbage truck, which brings it to a garbage dump. The balloon makes its escape from there and floats back, through snow, to return to Manhattan. There it wades through the busy, crowded street until you hear, “Ratso, keep your chin up!” This guy, who turns out to be a big schleppy long-haired man who speaks in a strong Jewish accent and is wearing a bright yellow jacket, turns out to be a television producer who has been recently fired for making an inappropriate joke about the American President, and is waiting for an old colleague who he chats with during her lunch-break as she gets a hot dog from a street vendor, and who he is trying to get to let him back into the company’s office. She says no, and then the balloon joins him. It’s strange how the balloon starts following him, and at first he’s in shock (“Where are the cameras? !”), but eventually they start to get along. Ratso, to no one’s surprise, is a hustler and uses his new friend to steal a dress from a high-scale fashion boutique to use as a gift to re-friend his colleague. When he gives it to her, she notices that it’s stolen and refuses it and walks away. And so does the balloon. It worth commenting upon the episodic nature of The Black Balloon and how in between each encounter the balloon is free-floating around and engaging with the locals. The music in the film is by Gong and the synthesizers with their futuristic sounds give these temps mort scenes a dreamy quality. The next stop for the balloon is in a park to watch-over a little girl. At first the little girl is upset because her mother is not paying attention to her but instead to the new man in her life. The mother is always sending the little girl away, either to look at or get something, while she uses the opportunity to kiss the man that she’s now with. There is a Sofia Coppola quality to these scenes in capturing of the young girl’s boredom and frustration. The girl plays with the balloon for a while and it circles around her, but she tries to pop it with a stick, and that is when it narrowly escapes. The next stop for the black balloon is with a poor middle-eastern man who uses the balloon as an excuse to visit his son and show it to him. Except that his son, Moustafa, is busy at work and it turns out that the man only went to hit him up for free food. He then asks the balloon to go and to leave him alone. The balloon drifts throughout the night and the following day the balloon returns to a NYC Balloon truck and decides to rescue all of the other balloons that are stuck in there. The black balloon hits the back window of the truck several times so that it shatters and all of the other balloons that are in it escape and fly out and are free. This is where the films open aired cinematography by Sean Price Williams can be really appreaciated as the colorful dots dance around the blue sky. And with this beautiful conclusion The Black Balloon is a great addition to the balloon film genre alongside Albert Lamorisse’s Le ballon rouge (1956), Hou Hsiao-hsien’s Flight of the Red Balloon (2007) and Peter Docter’s Up (2009). The trailer for Kazik Radwanski's Tower (MDFF) was first previewed when it played before Denis Côté's animal hybrid-documentary Bestiaire, when it recently had its theatrical release. Côté describes Tower, and you can see the blurb in the trailer as a "great curosity," and it's "like a wound that won't heal." Since Tower had it's world premiere at the Locarno Film Festival and then afterwards here at TIFF, Radwanski's Tower has been traveling the festival circuit (Viennalle, Belfort) gathering favorable reviews and an international reputation. Tower has recently appeared on indieWIRE's list of best undistributed films of 2012, and local film critic Adam Nayman includes a scene of Derek listening to Serani's song No Games as one of the best shots of the year. Tower does not yet have an American distribution, though hopefully it eventually does, but for now it's Canadian release has just been announced: it's theatrical run begins on February 22, 2013 at The Royal. Tower from Medium Density Fibreboard Films, will have a theatrical release at The Royal on February 22, 2013. This is the first guest contribution by Marc Saint-Cyr. – D.D. Regarding contributions to film studies and literature, I found 2012 to be a fairly bountiful year. Though I only read in their entirety but three new volumes of film criticism and analysis, each one offered up a wealth of insight regarding their chosen subjects and the areas to which they are linked. Indeed, in many cases the writers courageously ventured beyond the basic parameters of their topics, illuminating relevant and even revelatory connections both within and beyond the world of cinema. When at their best, these books made me marvel at and ponder not only the principles of great cinema, but also important aspects of life, humanity, and art that make great cinema (and great writing) so valuable to the beholder. These are not only great film books, but also simply great books. Of them, Geoff Dyer’s Zona: A Book About a Film About a Journey to a Room is easily the most accessible, written in Dyer’s familiar dry, wit-infused style. In what is essentially a scene-by-scene commentary on Andrei Tarkovsky’s 1979 masterpiece Stalker, Dyer discusses his personal observations and thoughts regarding the film and the array of feelings and ideas it fires in him. As he does so, he commendably remains fearless in declaring his tastes and opinions – filmmakers as renowned as Buñuel, Godard, Kieslowski, the Coen Brothers, Von Trier, and even Tarkovsky himself (specifically regarding his 1983 film Nostalghia, which Dyer describes as being “so far up itself”) are dismissed as being overrated or overly pretentious. But while in some parts Zona gives way to the delicious bitterness and irritation that makes Dyer so fun to read even if you don’t necessarily agree with him, in others he expresses with tangible sincerity and emotion the immense awe and respect he unfailingly continues to hold for Stalker, which I can certainly relate to given my own love for the film (which, rather than Dyer’s literary reputation, enticed me to pick up the book in the first place). Additionally, there are plenty of asides and tangents devoted to cinema, art, travel, faith, memory, and more, many of which contained in amusingly lengthy footnotes that sometimes run for several pages. In his refreshingly unconventional fashion, Dyer merges criticism with autobiography, making the reader acutely aware of the many ways in which the relationship between art and individual is forged and cultivated as one both gains more experiences from life and connects those experiences with special works. Virtually worlds away from Dyer’s free-flowing, conversational style is the tone of many of the pieces contained within Robert Bresson (Revised), the newly upgraded edition of James Quandt’s comprehensive text on the French master. Coinciding with an amazing retrospective of Bresson’s work at the TIFF Bell Lightbox earlier this year, the book gathers pieces from scholars and critics like Susan Sontag, P. Adams Sitney, André Bazin, and David Bordwell that range from analyses of Bresson’s themes and methods to in-depth studies of individual films. Often, the writing veers towards the academic, theory-heavy variety, and I’ll freely admit that I found some of the pieces quite tiring to get through. However, other pieces are much more reader-friendly and provide some fascinating material on Bresson’s remarkable career. Personally, I thoroughly enjoyed the pieces dedicated to Bresson’s mysterious early period as an artist: Colin Burnett’s Bresson in the 1930s: Photography, Cinema, Milieu, which explores his career as a photographer for advertising campaigns overseen by the likes of Coco Chanel, and Jonathan Rosenbaum’s Affaires publiques, which examines his little-seen comedic short film from 1934. Other highlights cover the opposite end of Bresson’s life, with Kent Jones’ A Stranger’s Posture: Notes on Bresson’s Late Films, Serge Daney’s The Organ and the Vacuum Cleaner, and Shigehiko Hasumi’s Led by the Scarlet Pleats: Bresson’s L’Argent all delving into the filmmaker’s intriguing late period. Nicely rounding out the volume are interviews between the man himself and such figures as Jean-Luc Godard, Paul Schrader, and Michel Ciment, a symposium moderated and edited by Quandt, and tributes from admiring filmmakers ranging from Michael Haneke to Louis Malle, who, when speaking of Pickpocket, boldly states “For the duration of the projection, Bresson is God,” to Jean-Pierre and Luc Dardenne, who, in their salute to L’Argent, describe the terrible influence of money and, as a contrast, the redemptive power of debt and transaction – facets of Bresson’s final masterpiece that are carried over into both the Dardennes’ films and those of Aki Kaurismäki. Between the Lightbox retrospective and the book, by the time I finished the latter, I found myself much more informed about a filmmaker whose work is, for me, still something of an acquired taste, yet an area of world cinema I very much look forward to continuing to study. With Quandt’s formidable volume sitting on my shelf, I feel pretty well prepared for that particular pursuit. A few months later, I dug into another collection of pieces devoted to a French filmmaker: Olivier Assayas, edited by Kent Jones and released in conjunction with both Assayas’ book A Post-May Adolescence: Letter to Alice Debord and his most recent film, Something in the Air, which I caught during TIFF in September and reviewed for Row Three. This was easily the most satisfying and consistently well put-together of the film books I read this year, with piece after piece showcasing some incredibly intelligent and compelling film writing of the kind that I myself constantly hope to achieve. Jones’ introductory essay, Westway to the World, alone stands out as a major highlight of the book, so on-the-nose and revealing is its assessment of the French New Wave, the burden of legacy that Assayas and other post-New Wave filmmakers had to face, and the evolution of Assayas’ unique approach to human experience and perception, which Jones aptly links to the sensations of motion, lightness, and energy that characterizes so much of his work. From there, the book launches into a marvelous succession of pieces on Assayas’ early films, with Glenn Kenny covering Desordre, Jeff Reichert L’Enfant de l’hiver, Alice Lovejoy Paris s’éveille, Michael Koresky Une nouvelle vie, and Jones L’Eau froide. I was most grateful to receive primers on two of Assayas’ most underrated films, Clean and Boarding Gate, courtesy of Nick Pinkerton and Gina Telaroli, respectively, while savoring Kristin M. Jones’ piece on Fin août, début septembre, B. Kite’s original comparative analysis of Fritz Lang’s Dr. Mabuse, der Speiler and demonlover, Geoffrey O’Brien’s lovely piece on L’Heure d’été, and Jones’ tantalizing one on Something in the Air. Just as Jones stresses Assayas’ choice to place character and narrative over any cinephilic or superficial priorities (a good strategy for any filmmaker, especially one living and working in a post-New Wave France), this book’s essays remain closely focused on Assayas’ work as well as the various experiences he places his characters in and portrays in his jolting, lively manner. The enthusiasm and respect Jones and company express for Assayas’ work is highly infectious, as is the filmmaker’s simple belief that truly great movies are not about other movies, but life. Once readers finish this book, they’ll be hard-pressed not to adopt that same view for themselves as they begin the inevitable retrospective of Assayas’ work and rediscover the freshness, cleverness, and sincerity of this remarkably talented artist. One of the most exciting things in the world of Toronto film-criticism - along with Andrew Parker's extensive reviews of each week's new releases - is the video-magazine, The Seventh Art. When most film criticism keeps using the written format - relying on second-hand descriptions of images - The Seventh Art excels with their video-essays by showing the scenes along with voice-over narration commenting on them. It is great news to hear that The Seventh Art is branching outward toward film programming as this week as part of a new initiative, the Live Directors Series, invited Whit Stillman to introduce two of his films. So at The Royal on Wednesday, December 12th at 7PM they are screening Metropolitan (1990) and on Thursday, December 13th at 7PM they are screening The Last Day of Disco (1998). “I have a theory that people should approach movie experiences like theater experiences. Every showing of a film, no matter what the format, is all performance, it’s about the interaction between the person and the piece. Even though the actor’s performance doesn’t change, it’s vastly different each time someone sees it, how they respond." It's exciting to have the opportunity to see these films with the director in attendance and with a lively host Christopher Heron to moderate the Q&A. The Seventh Art is a new video-magazine, based out of Toronto, that conducts extended interviews with leading local and world filmmakers – inspired, in style, by the French television show Cinéastes de notre temps – and produces high quality video-essays. The Seventh Art recently conducted a long interview with the guys at MDFF – Dan Montgomery, Kazik Radwanski and Antoine Bourges – where they discuss with them everything from their creative process, production, distribution and their films East Hastings Pharmacy and Tower. Christopher Heron, the lead interviewer of The Seventh Art, also made a video-essay about Radwanski’s MDF Trilogy - Assault, Princess Margaret Blvd. and Out in that Deep Blue Sea (“The films of the MDF trilogy all deal to a variety extent to a protagonist in crisis…”) – which is one of the special features on their handmade DVD.